Account Administrators can configure the IVR on the Office@Hand Online Account using the XML Editor. This tool assists in importing, exporting, and/or downloading sample IVR XML files. 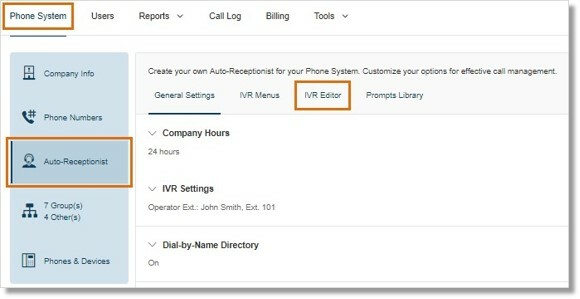 AT&T Office@Hand provides additional IVR tools to help you create and manage your IVR Menus. 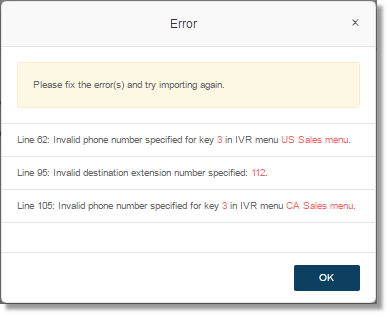 The Auto-Receptionist consists of 3 parts that help you configure your IVR: IVR Menus, IVR Editor, and Prompts Library. Check IVR – Visual Editor Guide | AT&T Office@Hand to learn how you can set up your IVR using the Visual Editor instead. Note: Any change in the IVR menu overwrites the imported XML file. It is suggested that you export and save a new XML file after making changes. Go to Phone system > Auto-Receptionist > IVR Editor. In the XML Editor section, you can import and export XML files for your IVR. Your IVR Menus are validated by Office@Hand once you import an XML file. You can download a sample XML template you can use. Under Download Sample IVR XML Files, click Single Level IVR or Multi-level IVR. Under Import XML file, click the Import button. Office@Hand detects configuration issues as soon as you click Import. You can manually fix the errors in the XML file and upload it again or you can click Accept and Continue to manually fix the errors using your Online account. Any change in the IVR menu overwrites the imported XML file. It is suggested that you export and save a new XML file after making changes. Under Export IVR XML file, click Export. The sample XML file is downloaded to your browser.